Today was the last day of classes before Holy Week. The last few weeks have been extraordinarily busy, so now is a wonderful time of retreat. This evening began the annual seminary retreat that leads up to Holy Week. I say annual, but note that this is really the first time this retreat has been done in 40 some years. It’s a time of rest, prayer, and recreation. Fr. Kurt introduced the retreat and pronounced the last word there “re-creation”–a time to be re-created, renewed, readied for Holy Week. 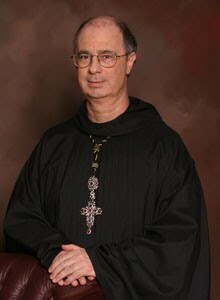 Archabbot Justin DuVall, OSB, is leading most of the retreat, through conferences. This evening was the first. It was an excellent conference but now I regret not having brought a pad of paper to take notes on. If Christ is preparing a place for us, he is surely preparing us for that place. God has a plan for everyone and he not only prepares the destination, but he prepares us as we journey towards it. He equips us, he teaches us, he leads us, he forms us. This is true for our short lives on earth but all the more for eternal life. Before a man can become what he is not, he must be what he is: an authentic human being. A good way to view this is by looking at the Eucharist; in order for the bread and wine to become that which it is not yet–the body and blood of Christ–, they must first be authentically bread and wine. Same is true with men in formation. We must be authentically men before we can become that which we are not–priests. By the sacraments we are invited to imagine what we can become, and then we become it. Baptism and Confirmation, for example, allow us to imagine what we are not yet but can become through the grace of the sacraments–not by our own merits. The Eucharist strengthens and forms us anew each time we worthily receive. Penance takes a frail, frail person and restores him once again with hope and grace. Etc. What a great time this retreat will be. Pray for us and know that I am praying for you. This entry was posted in Priesthood, Reflections, Retreats/Conferences, Sacraments. Bookmark the permalink. ← St. Nicholas Owen, "Little John"
We will all pray for one another. I really enjoyed and appreciate those three points. Thanks.